Fran is a ruminant nutritionist and Lecturer in Livestock Production in the School of Environmental and Rural Science. Her research interests range from the systems level of livestock production down to the metabolic level, studying the actions and interactions of nutrients with ruminant physiology. Fran completed her PhD at the University of Queensland, studying the effects of nutrition and heat stress on the physiology of dairy cattle, and how those factors affected the synthesis of milk protein. 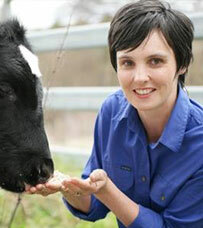 She has conducted research on sheep, dairy and beef cattle, in grazing and grain-fed systems. Fran has extensive experience in agricultural research in South East Asia. Fran has worked on research for development projects in ruminant livestock systems in Indonesia, Cambodia and Myanmar. In these projects she has lead a variety of research activities associated with animal nutrition, cattle growth paths, and village-based beef production systems and livelihoods research. Bachelor of Agricultural Science (Hons), The University of Queensland. PhD in Animal Nutrition, The University of Queensland. Schmoelzl, S., and Cowley, F.C. (2016) The case for pre-parturient selenium and iodine supplementation of ewes for improving lamb survival. Animal Production Science, (in press). Cowley, F.C., Barber, D.G., Houlihan, A.V. & Poppi, D.P. (2015) Immediate and residual effects of heat stress and restricted intake on milk protein and casein composition and energy metabolism. Journal of Dairy Science, 98(4): 2356-2368. Ratnawati, D., Cowley, F.C., Pamgungkus, D., Mayberry, D.E. and Poppi, D.P. (2015) Diet formulation for increasing the profitability of smallholder fattening operations in East Java, Indonesia. Indonesian Journal of Veterinary Technology. Cowley, F.C., Ratnawati, D., Pamgungkus, D., Mayberry, D.E. and Poppi, D.P. (2015) Increasing the profitability of Indonesian smallholder cattle enterprises by purchasing high quality by-product feeds (Poster). Tropical Agriculture Conference 2015, 16-18 November 2015. Brisbane, Australia. Cowley, F.C., Scott, F., Martin, B., and Iv, S. (2015) Characterisation of cattle-owning households and their feeding practices in North-West Cambodia (Poster). Recent Advances in Animal Nutrition Conference, 26-28 October 2015. Armidale, Australia.